Grayson loves doing crafts as you can tell. Okay, so maybe I love doing them! With a little one it’s hard to do certain crafts because of course at this age there is not a lot they can physically help you do; but when you can control their hands and feet and help them create a special little gift it makes it a little easier. So handprint and footprint crafts are the way to go! 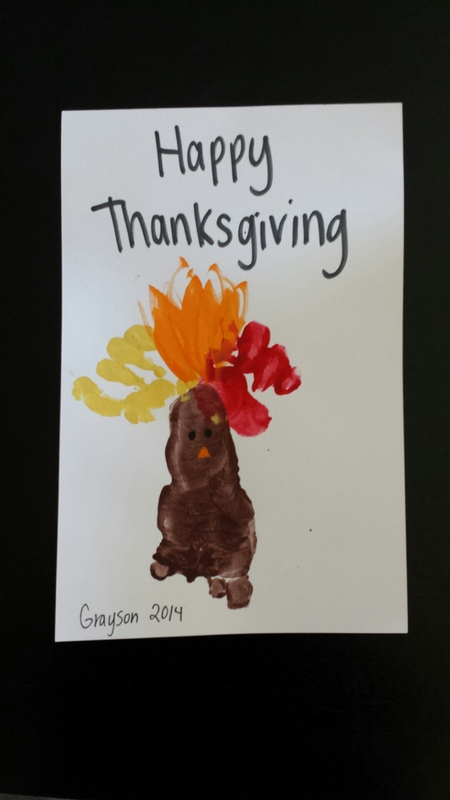 For our Thanksgiving craft we sent out little turkey cards. We did about 15 of these and lets just say after awhile Grayson was getting pretty ansy and started crying. I did all the brown feet on one day and after a couple days of drying I did the hand prints. I had to have my husband help on this one so I could get done quicker since little Grayson was not too happy. So Brent would hand me one card I’d stamp his hand quick and the process continued until we finished all 15. It’s a pretty simple gift, and I made one for ourselves as well, but it will definetly be cute to look back on. 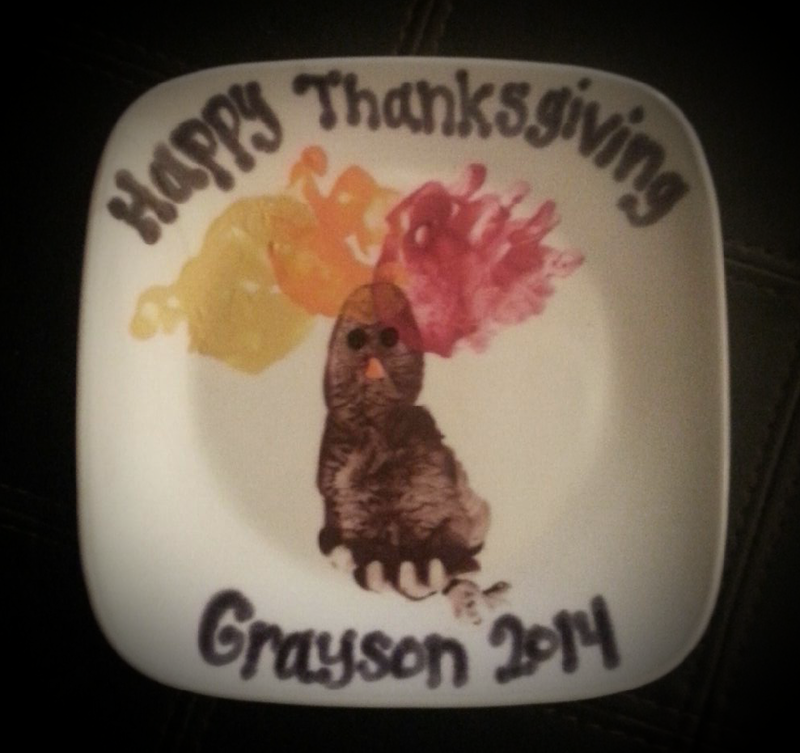 For Brent and I’s parents I also made them a turkey keepsake plate. Same concept, but I had a little crafting fail. I had wrote with permanent black marker on the plate after I baked the plate in the oven to keep the paint from falling off. Well after I had done the baking and wrote on it, I used acrylic spray paint to seal the paint and give it a gloss finish. Well lesson learned, use tape to block off the sections you don’t want to be sprayed because the paint made the permanent marker spread and bleed a little. But if you don’t use the tape and spray the whole plate the permanent marker won’t be able to write on the plate. We had a fun tim doing this and even got a little red paint on my white carpet, but thankfully it came out! This is such a great idea! I’m adding this to my Christmas craft list. But handprint Santa’s. Thank you! You welcome I would share our Christmas craft I did but I don’t want family to see yet so after Christmas I’ll post! We tried something similar to this with my 15 month old. Let’s just say some jeans had to be sacrificed for the effort. In the end, it was fun, but I can’t say it came out looking like anything that would turn into a family treasure! Yours is very cute though! ← How Well Do You Know your Baby’s Poo?